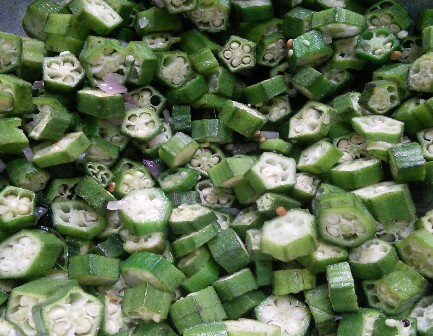 Ladies finger/okra is a high fibre vegetable and are easy to cook. When it comes to preparing a side dish for rice with ladies finger there are many interesting dishes that tastes good. This ladies finger poriyal is prepared with lots of chopped onions and coconuts. You can eat this poriyal simply as a salad. 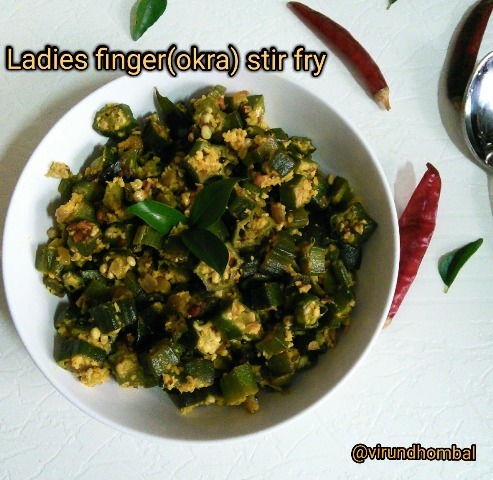 Be it a poriyal or sabzi, always use fresh ladies finger. Please avoid refrigeration for ladies finger because it loses its beautiful colour and texture. If you are using refrigeration use within 1 or 2 days. And one more point store them in a cotton cloth bag. After washing the ladies finger spread them in a towel for 30 minutes and then chop them. 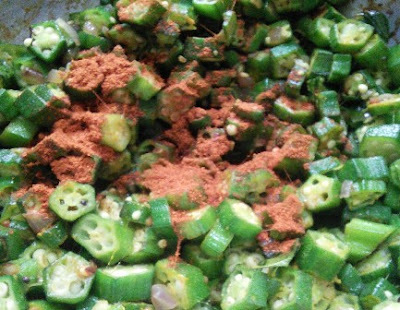 I always suggest to cook with less oil for any dishes made with ladies finger. If you follow these simple instructions you can get perfect results. Now let's see how to prepare this poriyal. 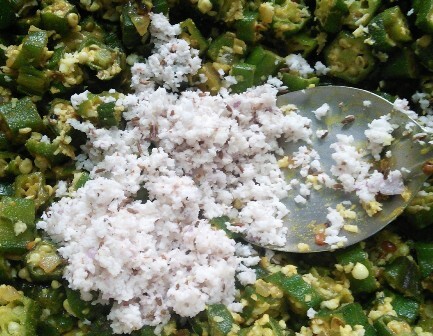 This ladies finger poriyal is prepared with lots of chopped onions and coconuts. You can eat this poriyal simply as a salad. Wash the ladies finger and drain the water completely. Spread them in a towel for 30 minutes. Grind the coconut, small onions, cumin and garlic cloves coarsely. No need to add any water for grinding. After 30 minutes, remove the crown and the tip and chop them evenly. Heat oil in a kadai and add the mustard and urid dal. When it splutters add the onions. Saute them on a low flame till soft. Next add the chopped ladies finger and saute them well. Next, add the chilly powder, turmeric powder and required salt. Mix them well and cook. Now add the curd and mix it evenly. Splash some water over the ladies finger and cook. When the ladies finger becomes soft, coconut paste. Cook them on low flame for a few minutes and switch off the flame. Transfer them immediately to the serving dish. Heat 2 tbsp oil in a kadai and add the mustard and urid dal. When it splutters add the onions and the curry leaves. Next, add the chilly powder, turmeric powder and required salt. Mix them well and cook. Continue to stir for a few minutes. Now add the curd and mix it evenly. Splash some water over the ladies finger and cook. 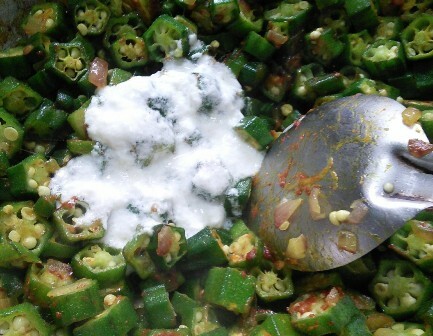 Curd is added to prevent the stickiness in the ladies fingers. When the ladies finger becomes soft, add the coconut paste. Cook them on low flame for a few minutes and switch off the flame. Transfer them immediately to the serving dish. Serve it warm with any rice varieties and also for any kuzhambu varieties. 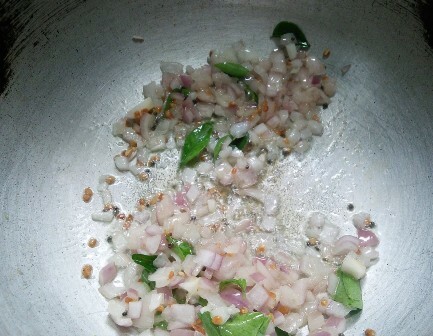 If you do not have coconuts just crush the small onions, garlic cloves and cumins in a mortar and pestle and add it in the final stage. If you try this recipe for Ladies finger/Okra stir fry send us your comments below and share the recipe for your firneds and family. I like all ur recipes . Excellent.